Si l'emplacement est important pour vous, ne négligez pas notre propriété. Notre maison est nichée au-dessus de Seven Springs Resort dans une communauté fermée nommée Southwind. Soyez le 1er bas de la montagne sur ces matins enneigés. Avec notre ski in / ski out fonction, vous obtiendrez le meilleur parti des pistes tandis que d'autres font la queue. De la cachette de ce skieur, vous pouvez montez sur la piste de ski juste à côté du porche arrière et revenir est aussi simple que prendre l'ascenseur de ski haut de la page. Et Seven Springs est une station toutes saisons! Notre établissement donne sur une piscine privée chauffée et bain à remous pour Southwind invités qui repose au sommet de la montagne. Seven Springs Resort a beaucoup à faire; VTT, tyroliennes, glissades alpines, ball-trap, des tubes de l'été, le golf, frisbee golf, parcours de cordes, miniature en or, bowling, randonnée, pêche et bien plus encore. Plus de détails sont fournis ci-dessous concernant les nombreuses activités au sein d'une distance proche de conduite à notre propriété. Cette belle maison de ville compte plus de 2400 sq. Ft. D'espace de vie. Vous pouvez dormir confortablement 8-10 dans cette maison spacieuse multi-niveaux dans ses quatre chambres. Notre cuisine entièrement équipée est parfaite pour préparer un repas rapide entre les courses. * Le service de navette d'hiver du voisinage à des activités partout dans Seven Springs. L'hiver est un moment privilégié au Seven Springs et cela peut être votre destination vacances d'hiver spéciale de la famille. Ski Magazine classé Seven Springs que le # 6 Top Resort dans l'est des Etats-Unis! * L'utilisation de toutes les commodités, y compris Seven Springs mini-golf, bowling, golf, plusieurs salles de jeux, restaurants, ball-trap, etc. * Lake Tahoe est juste au-dessus de notre propriété. Le lac dispose en été propose Hydro Vélo, Pédalos et kayaks. * Seven Springs Festivals et événements spéciaux: Autumnfest, Polka Festivals, vin et Food Festival, Winterfest et Summer Concert Series. Cette location comprend l'utilisation de la nouvelle Southwind Clubhouse, exclusif à Southwind propriétaires et les invités. Il possède une grande piscine à la recherche sur les pentes avec des vues incroyables. Il comprend une grande télévision à écran LCD et un état des installations de conditionnement physique de l'art avec douche, table de billard, baby-foot professionnel, et beaucoup d'espace pour les jeux. Les attractions touristiques incluent: Fallingwater, Fort Ligonier, Idlewild Amusement Park, Musée Flood Johnstown, Kentuck Knob, Laurel Caverns, trésors vivants Animal Park, Somerset Historical Center, rafting en eau vive, et le Caddy Shack Family Entertainment Center. sont à une courte distance. Interdiction de fumer ou les animaux sont acceptés dans notre propriété. Photos sont disponibles sur demande. Clean, comfy beds, location to the slopes was good! We have stayed at 2 other properties in Southwind and all similar inside but different locations within the community. This one was off one of the trails so didn't need to use the Southwind lift but outside the condo was icy and treacherous and not maintained or groomed. Would have preferred an inside condo for this reason where there is snow making and access to the lift . Overall inside of condo was clean. Downstairs was very cold despite following recommendation by the owner to keep certain doors open and closed to make it warmer. Could also use more couches in the main living room. We always enjoy ourselves and time with our family and friends and this time was no exception! We're pleased that you enjoyed your time with us at Southwind. Ski in/out access from our property for about 100 yards is whatever nature offers. If there is rain or warm conditions prior to a stay followed by freezing temps, it will be icy in the area immediately adjacent to the homes headed down to Phillips Run. We tend to walk down above this, beside the pool, to reach the slopes if these conditions exist. Most weekends we can ski down. Early season access to Phillips Run is sometimes preferred since the trails inside Southwind aren't yet opened. Temps in our lower level are about 8 degrees colder than the upper two levels. For this reason, we have space heaters in both rooms that keep them comfortable to whatever temperature our guests prefer. See pics for the "Ski Room" and "Rec Room", they are both on the lower level. 6 adults and 3 teens shared this house and had enough space for all! Temps were below zero when we arrived so fireplaces were perfect! Lowest level had extra heaters which guests said worked well. All loved having the ability to ski out/ski in. Beautiful view!! Kitchen was stocked with everything we needed even a Crockpot & single serve Keurig. Overflow parking was very close so parking was not an issue. Bedrooms were very spacious and comfortable. Game room even has 2 pull out loveseats, if extra sleeping space is needed. Bob was very easy to communicate with and truly cares about his guests comforts. Everything he provided: sheets, towels, soaps were good quality. Teens loved WiFi access and their own space to watch movies. Grownups took the Seven Springs shuttle one evening to go to Helen’s. It was very convenient and nice to not need to move our vehicles. We couldn’t have found a more comfortable, convienent, relaxing place!! May even try staying her in the summer as you are just yards away from the community center with an outdoor pool! This is an amazing property with a fantastic view and location. We have been using VRBO for several years and this property is by far the best and cleanest property we have stayed at. The most difficult thing we had to do was pack up to leave, we would have loved to be able to spend more time here. We're already looking forward to our next trip! The house was beautiful, clean and had everything we needed. The ski in ski out was so convenient. We could stop home for lunch and then head back out to the slopes. We took advantage of the shuttles to go down to the lodge at night. The house was perfect for two families and the media room is a bonus. We would definitely stay here again!! This is very nice condo. The unit is well maintained and tastefully decorated. There were nine of us and we fit perfectly. Also, the location is great for skiing. We were able to ski from the back porch of the condo and ski back (the condo is just a short distance from the top of the Polar Bear Express lift). Also, the condo is close enough to the Tahoe Lodge that our non-skiers were able to walk up from the condo to have lunch withe the skiers. PLEASE NOTE: A 3 night minimum is preferred for Christmas and New Year's Weekend. Additional nights will be discounted greatly. 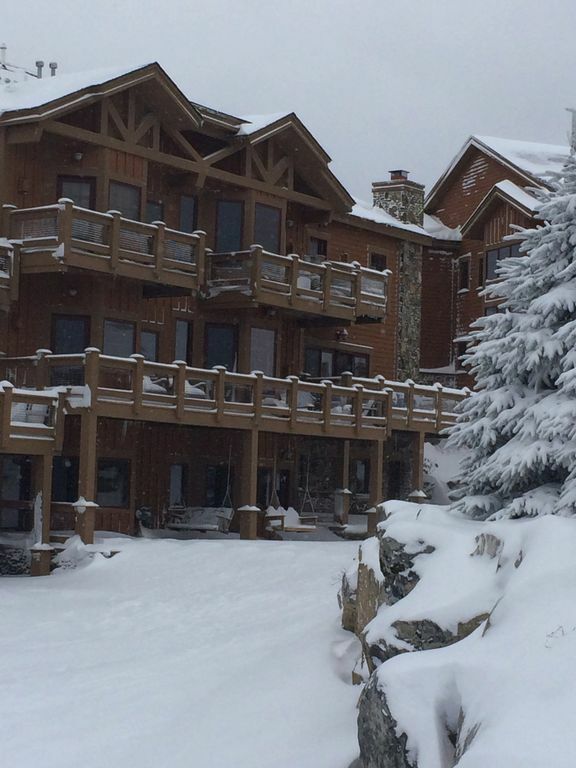 Peak season ski rates are $3,200 for a 3 night minimum stay. Addl. nights will be discounted. Call for weekly rates. Must be 25+ and have valid drivers license in order to rent property.